Click here to make reservations. Once you enter your arrival and departure dates, you will need to click on “Add Special Rate Codes” and enter MHC to see your discounted rates. Directions to Hampton Inn Emerson. Directions to Hampton Inn Acworth. Directions to Fairfield Inn Acworth. NOTE: The hotel is behind a Wendy’s, and there are two ways into the hotel parking lot depending on whether you’re coming from Acworth, or from the north via the Interstate. It’s a busy intersection, so please plan ahead, and be a little patient. This is a very nice hotel, so it’s worth finding the parking lot. If you are part of the group being registered, please make sure to enter yourself as either a Ruling Elder or Observer. Teaching elders should register as individuals. One name per line; no titles, please. 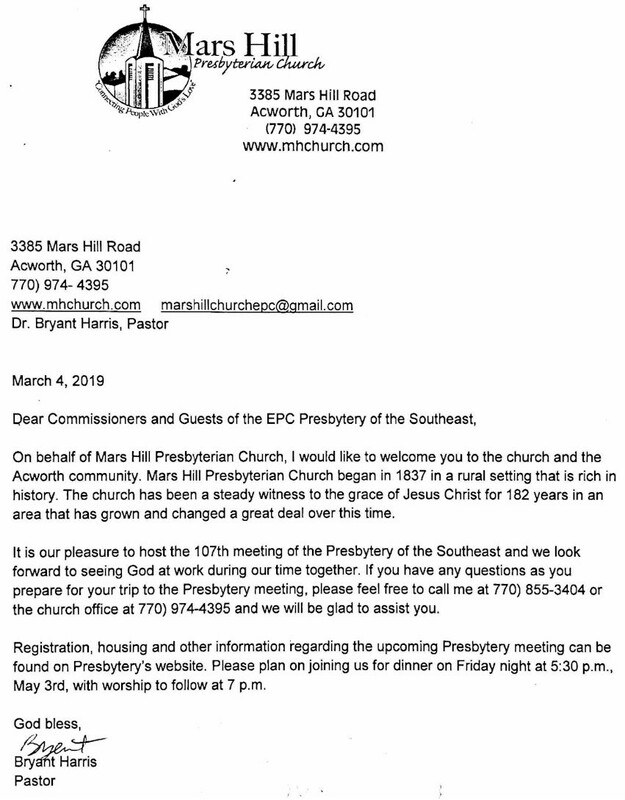 You may pay by cash or check made out to Mars Hill Presbyterian Church.